I'm still on a massive Wimbledon high, this is partly due to Andy Murray being grumpily awesome and the rest down to the sugar rush from this giant booze cake that I made for our tennis party. The best thing about naked cakes is that you don't need to faff about with icing, its FAR too hot to be doing that, just bake your sponges, slice them up, fill with boozed up cream and you are good to go (and make another jug of Pimms). I've gone with the baking doyenne that is Mary Berry's sponge recipe and just tinkered slightly, mainly because it doesn't involve creaming together butter and sugar (I just find that really boring and I get butter EVERYWHERE) and her method is super quick and easy. I've used St Germain elderflower liqueur but for an alcohol free version try our elderflower and lavender syrup and if your not feeding a large crowd of people just reduce the quantities by half. 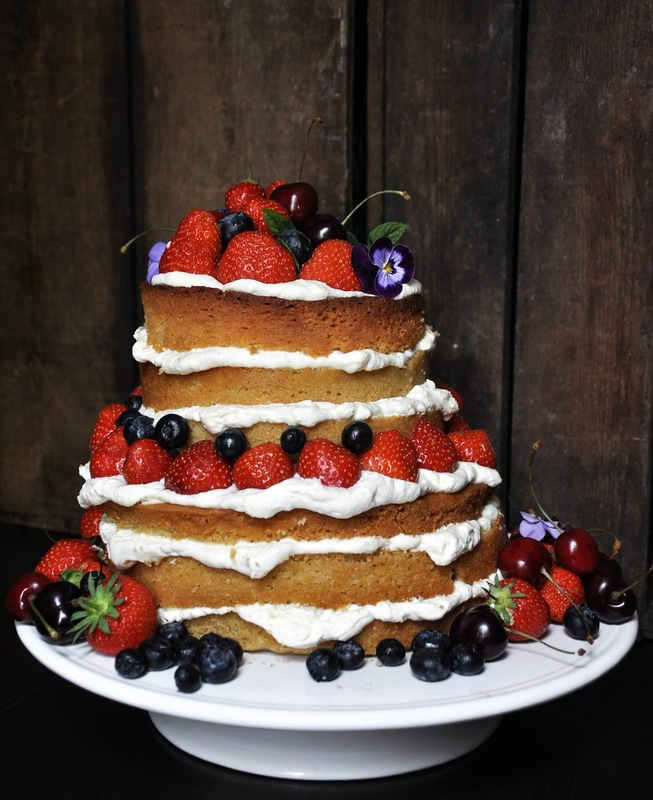 Once you've got the elderflower bug, get inspired with our top ten elderflower recipes. Preheat your oven to 180C/350F/Gas mark 3. Line 2 cake tins (I went for one measuring 24cm x 10cm and a smaller 15cm x 12cm one)with baking paper and lightly grease all the inside. Combine ll the cake ingredients in a big bowl and beat with an electric mixer until fully combined (don't over mix though you just want everything to come together and not be all lumpy and floury). If your eggs are a bit small and the mix feels really dry add a couple of tablespoons of milk to loosen slightly. Divide the mix between your tins and bake in the middle of your oven for about 1 hour. Check on them after 45 minutes, they are ready when the centres are springy and a skewer comes out of the middle clean. If they take a long time to cook (mine do as my oven is rubbish) just cover the tops if they start to get too brown. I ended up just cranking the oven temperature up to 200C for the last 15 minutes but play it by ear. Once cooked leave to cool in the tins for 10 minutes before removing and leaving to cool on a wire rack completely. Once cool slice each cake into thirds. I use a bit of cotton to do this and just pull it through from the back to the front like a cheese slice. Using an electric mixer beat the cream ingredients then divide between the layers of the cooled cakes, decorate with fresh fruit and a sprinkle of icing sugar. Now THAT is a cake. How on earth do you cut a cake like that? !